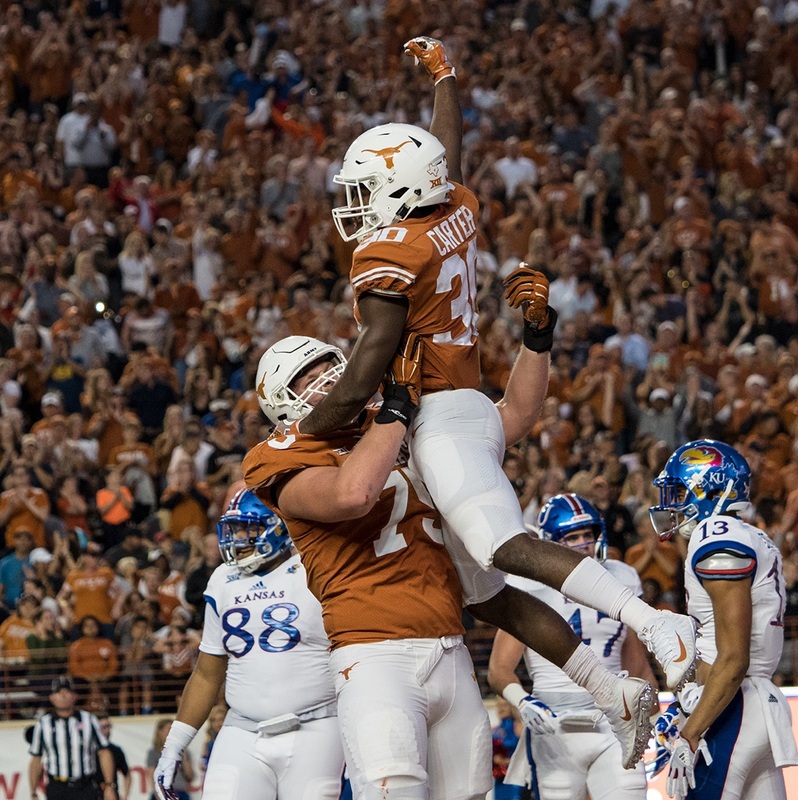 As expected, Texas used both Shane Buechele and Sam Ehlinger Saturday night, though the freshman was used much more sparingly. Buechele started fast, hitting Lorenzo Joe on a 49-yard touchdown bomb just nine seconds into the game. Buechele finished the game with completing 22 of 32 for 249 yards and 1 touchdown, but suffered a horrendous interception early in the fourth quarter that would’ve been devastating against a better team. 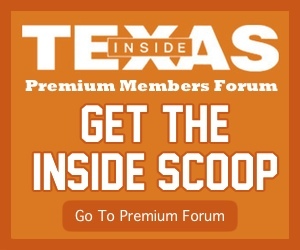 Ehlinger got on the board in the first quarter, too, hitting Cade Brewer on an 8-yard touchdown pass late in the first quarter to push the Texas lead to 28-7. What is my “quick thought” about the quarterback play after Saturday night’s game? I think Ehlinger is definitely more equipped to be the starter at West Virginia next week; for whatever reason (offensive line struggles, no running game, etc. ), Buechele is now starting to do the one thing he can’t do, and that’s be careless too often with the football. Texas needs all it can produce out of its quarterbacks to somehow salvage a win in the final two games. Additional thought: Buechele is EXTREMELY lucky that Dorance Armstrong dropped a potential pick six in the third quarter with Texas leading 35-20. It’s rare that you change starting quarterbacks after a win, and it’s absolutely not totally Buechele’s fault, but I believe it’s time. Suspension and injury, respectively, left the Texas defense minus Holton Hill and P.J. Locke in the secondary. My quick thought on this subject is actually two thoughts: one, the Longhorns – especially very early and very late in the game – seemed determined to show that they could continue their defensive dominance. Two, Texas absolutely missed both defensive backs. Yes, Antwuan Davis had a pick six in the first quarter, returning it 16 yards for the score, and added another pick in the third quarter. But the Longhorns also struggled to close the deal and finish off the Jayhawks, which makes me believe they definitely missed their two absent defensive backs. Perhaps the clearest sign of UT’s roller coaster is reflected in the numbers produced by the TCU quarterback, Carter Stanley. Stanley finished the game 27 of 43 for 268 yards with 3 touchdowns and 3 interceptions. Another sign that shows some of the struggles of the Texas defense: Kansas had the possession-time advantage 30:23 to 29:37. Definitely a mixed result for the Texas defense, giving up 27 points to the worst team in the league. Not much improvement at all in the Texas running game. In fact, since this story is about “my” thoughts, I’ll just share this: there was NO improvement in the Texas running game. Chris Warren – who many pegged as a 1,000-yard back prior to the season, was an H-back/tight end against the Jayhawks and had one carry, albeit for a short touchdown (after a review, lol). Daniel Young was the leading rusher with 21 carries for 67 yards, but 21 of those came on one run. Toneil Carter finished the game with 34 yard on 3 carries, with 23 of those coming on one carry. At the end of the third quarter, no one else on the Texas team had double figures in rushing. The final starts might detach your retina: 40 carries for 113 yards, for an average of 2.8 yards per carry. But rather than continue to harp on the fact that Texas can’t rush the ball, Tom Herman has decided to accept his reality in 2017 and just try his best to get two more wins. And that’s the proper mentality to have, right now. The Texas running game is absolutely non-existent, even against the awful Jayhawks. It is what it is. Ugh. Joe is a senior who has been the epitome of a “good soldier” during his time in Austin. He came to Texas after a career as a high school quarterback for Abilene Cooper, but really hasn’t been able to get himself into the lineup long enough to rack up significant stats. Saturday night against Kansas, he was able to get those stats, though: 5 catches for 98 yards and a touchdown. Joe put the numbers up despite yet another inconsistent game from the Longhorns at the quarterback position. When you factor in the loss of his brother earlier in the season, it’s easy to root for Joe; in a career marred by losses and difficulty getting on the field at all, it would be nice for Joe to see some more big games at the end of his time at Texas. There are approximately 28 million people in the state of Texas. Some 320 million folks live in America. About 7.4 billion live on planet earth. And still, the University of By Gawd Texas cannot find a dynamic running back or develop a kicking game that can consistently convert a 40-yard field goal. With this offensive line, this running game, this field goal unit, I’m not completely convinced that Herman shouldn’t win national Coach of the Year if the Longhorns qualify for a bowl game. Seriously.